Flush with Frame grilles are the preferred style for sand and finish hardwood floors where an architecturally smooth look is desired. Each frame is grooved on the outside to accomodate most 3/4" tongue and groove flooring. All grilles are 3/4" thick, with 1 3/8" wide frame which adds 2 1/4" to the overall dimension of the grille. Adjustable dampers are available for all standard sizes. Blades can run long direction, straight or angled, or short direction in 2-way or 3-way diffusion. 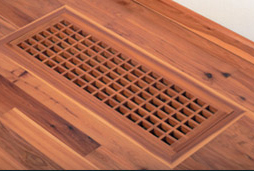 These supply air vents are also available in 1" x 1.5" on center rectangles, 1" x 1" on center squares and 1.5" x 1.5" center squares. Custom thicknesses and sizes available upon request.